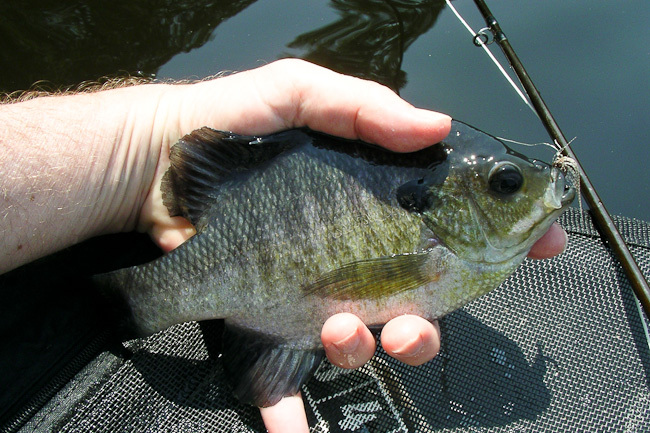 I spent Thursday morning fishing one of my favorite ponds for sunfish and bass. Though it is usually during the last two weeks of June that I get in my first day of float-tubing for panfish, this year nevertheless felt a bit weird. That's because by now I typically have logged in multiple days of trout fishing on at least two of my favorite trout rivers. High water is periodically a problem on rivers and streams, and this year was no exception. Not only does high water make wading difficult, but it interferes with the stocking program. Then, when the fishing looked good I had family commitments and then a long weekend at a college reunion (I'm not complaining about the family commitments and the reunion... they were far more important than fishing!). The bottom line: I haven't been out much this year. So, fishing today made me feel that I've missed a big part of the season. Well.... that's life. ﻿This is the first bluegill of the year. A real 8.5" beauty. 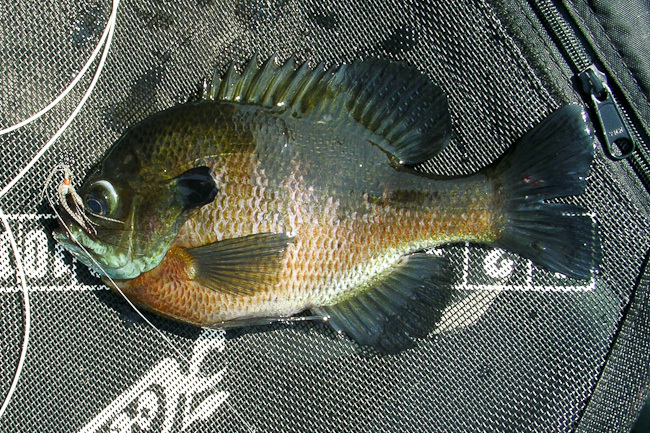 Above is my first sunfish of the year. A real beauty 8.5 inches long. I measured every large and every small fish I caught, which I do from time to time to get a sense of the fishery. I caught about 50 sunfish though I only found them in bunches along two 30-foot sections of the shoreline. The circumference of the pond is about one mile. Anyway, the smallest was 8" and the largest (pictured below) was 9.5". This is typical. 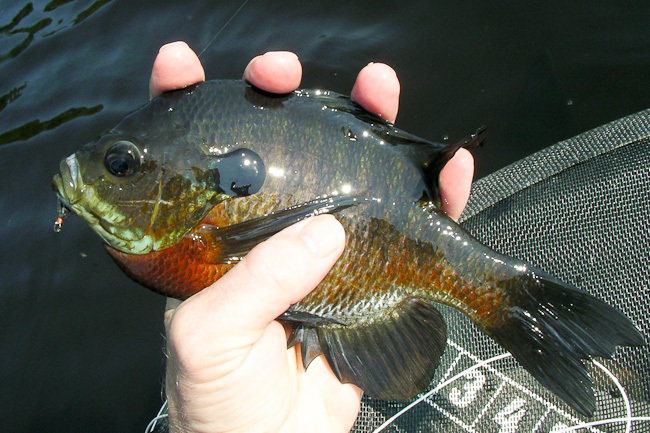 If I didn't know any better I would say sunfish are born 8" long! I wish I knew the biology of this. Where are the small fish? I can only speculate that the large ones are more aggressive, or that the small ones are taught to wait in line (LOL). 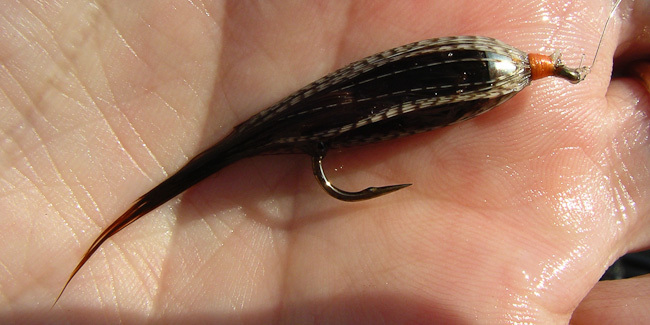 Perhaps it is because I use big flies, the one used today being 1.5" long on a size 8 hook. This was the largest, at 9.5"
Nearly void of color. Post spawn? 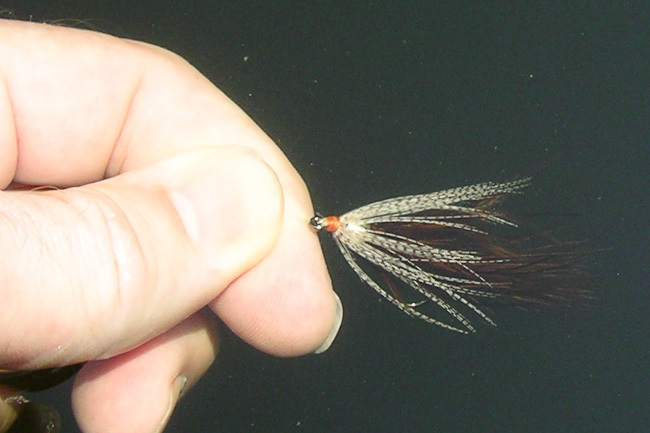 The fly of the day was a brown Conehead Combo on a size 6, 2xl hook. Held in water, you can see how nicely soft hackles like mallard and marabou display themselves. I used three of these. The first two remain in submerged logs. I also catch the occasional bass. Just two today. 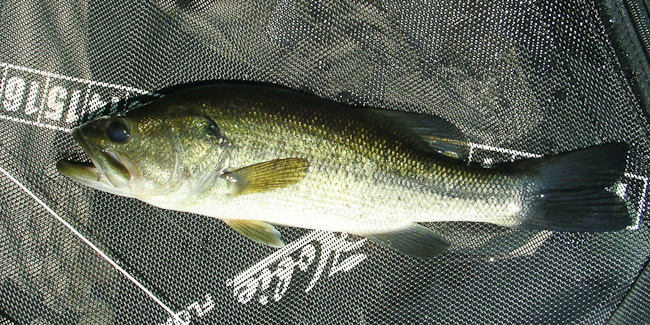 Now, if I were willing to fish with spinning gear and shiners I would have a ton of big bass to show you! But I will leave that kind of fishing to others. Are flies still packaged this way?